Carrot Halwa is made in India in the colder months when carrots are cheaper and aplenty. By cooking the carrots in sugar syrup they can be easily frozen, thawed and eaten through the year by adding the khoya, which is also available year round, when you are ready to serve it. 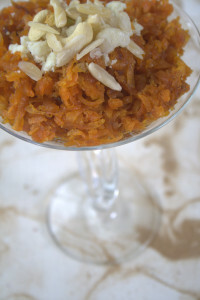 You can also cook the carrots in cream or milk for a fabulous Halwa but it doesn't freeze as well. 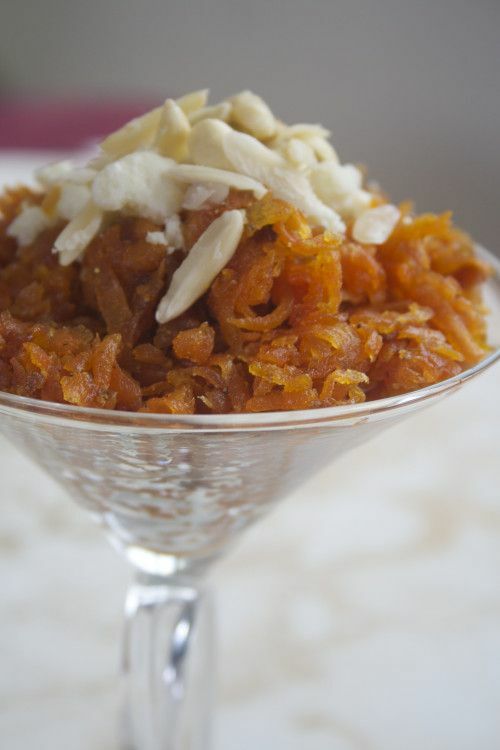 One of the great desserts of the Indian subcontinent, Indian Halwa differs from the middle eastern Halwa which is a solidified paste of seeds or nuts and syrup and generally lactose free. Indian Halwas are vegetables, fruit or semolina cooked in water, milk or syrup. In this recipe the carrots are not cooked in milk but in a sugar syrup and the Mawa or solidified milk is added just before serving. I find that carrots cooked in syrup freeze much better without high milk content. When they are cooked in milk they tend to sour faster in the refrigerator. If you are allergic to almonds you could also use pine nuts, Charnoli or omit them altogether. Use good quality dark red winter carrots during the season to get the best flavor. PLEASE CONSULT YOUR DOCTOR IF YOU HAVE HEATH RESTRICTIONS, DIABETES OR ALLERGIES BEFORE ENJOYING THIS RECIPE. Heat ghee in a large Kadai or Dutch oven on medium heat. Add grated carrots and sauté on medium heat for 10-12 minutes until carrots begin to lose their water. Add sugar syrup and continue cooking on low heat. The carrots will release water which will dissolve the sugar. As the carrots cook and soften they will release more liquid. As the mixture dries up lower the heat and stir more frequently. Scrape sides to prevent burning, until the mixture thickens and reduces to 1/2 original volume: this takes about one hour. All water must evaporate. The consistency should be crumbly and the carrots soft and creamy. Add powdered cardamom and stir well. Taste for sweetness. Warm the carrots before serving and stir in the khoya or mawa (crumbled and at room temperature) until evenly distributed. Garnish with toasted nuts and serve warm, either plain or with rabdi, vanilla ice cream for an over the top treat. If you plan to freeze large quantities do not add the Mawa. Freeze the carrot mixture as is, defrost, heat and stir in Mawa just before you serve it. This homey and rustic dessert is delicious and simple to make. Its called a turn over because the pastry square is turned over the filling and sealed before baking. Buy butter free or lard free puff pastry if you are vegan. Whats available at local Irani cafes is often made with margarine or vegetable fat but do double check. You can also substitute the raisins and honey with lots of chopped dates and pecans. The recipe will give you 16 generous sized turnovers. You can also make them much smaller, bite sized even. Combine honey, cinnamon and lime juice. Peel and slice apples into 1/4 inch cubes. Toss with lime juice, cinnamon honey, walnuts and raisins. Cover. Flour a clean flat surface. Cut puff pastry into 4 equal pieces. Keep 3 pieces covered with clean damp cloth. Roll out the fourth piece into a square about 1/4 inch thick. Using a knife or pastry wheel or cutter cut into 4 equal squares. You will fold this into a triangle after filling it so ensure that the squares come off the floured surface easily before you fill them. Use a very flat spatula to loosen them by sliding the spatula under each square. Place 2 tablespoons of the apple mixture in the center of one half of the square and spread inwards. 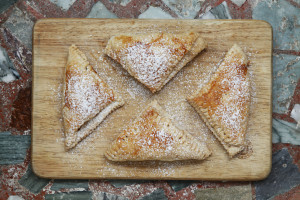 Hold the empty corner of the square and turn it over to form a triangle and cover the apple mixture- a bot like making Baklava or a phyllo dough samosa. Use a fork to press down the sides and seal them. Prick the top of the turnovers a couple of times with a fork to allow air flow. Repeat with remaining squares and then again with the three portions of dough. 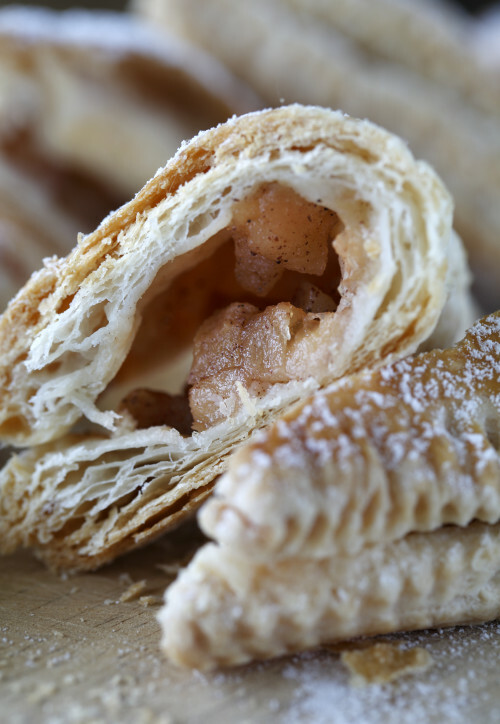 Brush each apple turnover with egg wash if desired. If vegan skip this step. Place on a non stick baking tray and baking in the center of the oven for 25-30 minutes until golden brown. When the tray goes in reduce temperature to 350F. Serve at room temperature or warm with vanilla ice cream. 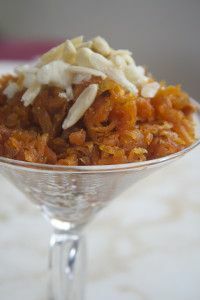 This sweet and festive dish served by the Bene Israeli Jews of India on important occasions like weddings and high holidays is really and truly a fusion of Indian, (specifically Konkan) and Sephardic Jewish traditions. It somewhat resembles a Chiwda or Bhadang, a trail mix of parched rice, nuts and coconut favored by Indians. Pohe or flattened rice is typical of Maharashtrian households and is made in many different sweet and savory ways. The Kande Pohe ceremony and its meaning is well known to Maharashtrians. Pohe comes in varying grades too, thick, medium and nylon -the last being a pohe that can be eaten without cooking. Many of the ingredients that go into Malida are symbolic in meaning to the Jewish community and interesting also to the Hindus and Muslims in India. 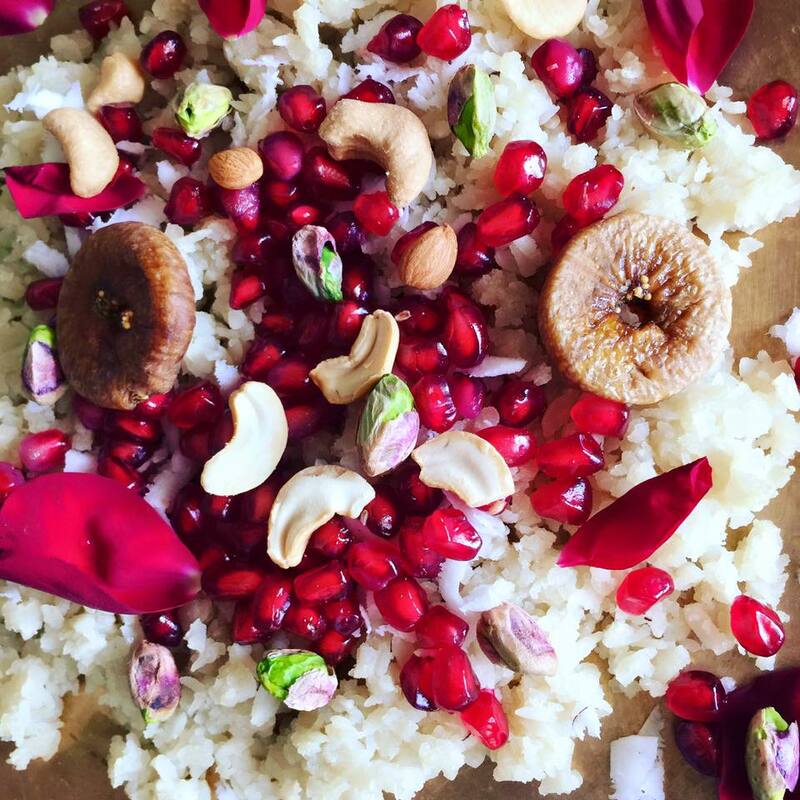 Ingredients like figs, pomegranates, dates and rose petals are abundantly available in the sub continent. Fruits such as pomegranate, grapes or raisins represent spring and birth in Judaism. The pomegranate has a special place in Jewish life and represents learning and success. Like dates and figs, pomegranates are part of the shivat haminim or seven fruits and grains of ancient Israel. Grown in the Mediterranean region for several thousand years there are specific references to the pomegranate in the Bible. In the Bible 1 Kings 7:13-22, pomegranate is depicted on the capitals of the two pillars of the Jerusalem temple built by King Solomon whose crown too was designed to copy the that of the pomegranate. This fruit also appears on ancient coins of Judea. The pomegranate is a symbol of righteousness because it is said to have 613 seeds, which corresponds with the 613 mitzvot, or commandments, of the Torah. For this reason and others, it is traditional to eat pomegranates on Rosh Hashanah. Pomegranate called Dalimb in Marathi, (not to be confused with Dalimbi) is believed to have its origins somewhere in the areas between northern India and Iran and the fruit is often mentioned in the Ayurvedas as a cure for many ailments. Pomegranate is also believed to be on of Lord Ganesha's favorite fruits. In the holy Koran it is one of the fruits that grow in the gardens of Paradise. Fig trees of which, there are several species are amongst the most revered India-Peepal and Bodhi among them. Figs are believed to be one of the earliest cultivated trees in the Middle East with fossils being found in the Jordan valley dating back 11,000 years, pre-dating grain cultivation. Dates are said to originate in Iraq but fossil remains have also been found in the Indus Valley and Harappa. A date palm cultivar, known as Judean date palm is said to have successfully sprouted after accidental storage for 2000 years in Masada. This particular seed is said to be the oldest viable seed ever found. COVER THE POHE IN BOILING WATER ABOUT 20 MINUTES. TOAST THE KHUS KHUS SEEDS IN A DRY PAN. MIX THE CRUMBLED JAGGERY AND COCONUT AND ADD TO THE PAN. TOAST LIGHTLY 1-2 MINUTES. COOL COMPLETELY AND STIR INTO THE PUFFED POHE SO IT IS WELL INCORPORATED. YOU CAN USE YOUR FINGERS TO TOSS AND CRUMBLE THE JAGGERY AND COCONUT INTO THE PARCHED RICE. STIR IN GOLDEN RAISINS, FIGS, DATES AND ZEST. SPRINKLE WITH POWDERED CARDAMOM AND STIR WELL. TOP WITH TOASTED NUTS AND POMEGRANATE SEEDS. DECORATE WITH ROSE PETALS AND FRESH FRUIT.